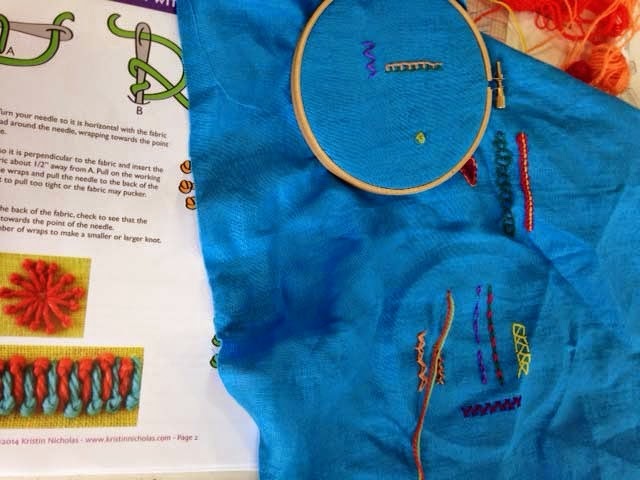 Getting Stitched on the Farm: Crewel Embroidery Class, Samplers + News! 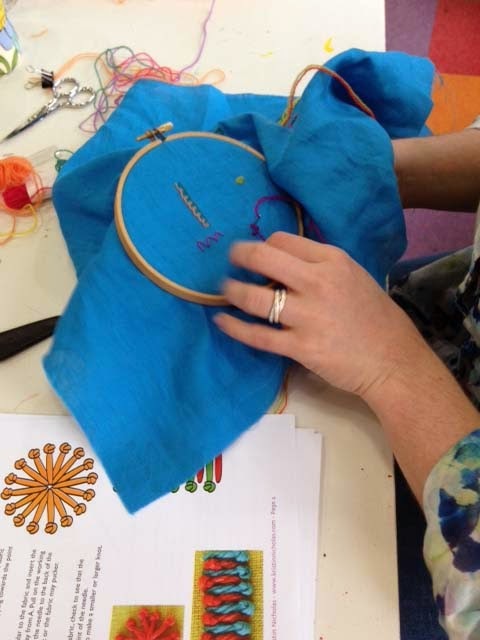 Crewel Embroidery Class, Samplers + News! I made it through the first Crewel Embroidery Retreat of the year. It was the first time I taught this particular class in-studio and there is always a learning curve for me. I had a small group of very nice students and we had a fun day stitching together. I am thankful they were patient with me. 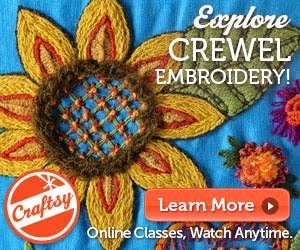 I taught 18 Crewel Embroidery Stitches - none of which are included in my on-line Craftsy class. I wasn't sure we could fit them all in but we did. They were quick studies. We even had enough time to transfer the bag design to fabric. We used the Sulky transfer pens. These things are great - especially when working with dark colors. You trace over what you want to transfer and your tracing becomes an iron-on transfer (you have to use a reverse image though depending on your design). Everyone left with a piece of linen in a color of their own choosing with their design on it and they could begin stitching that evening, if they weren't too pooped. This move for me into teaching Crewel Embroidery and developing stitching kits has been a bit of a gamble. I am not at all known in the stitching world. When I first wrote Colorful Stitchery which was published by Storey in 2006, I thought that all knitters stitched just like me and that they would follow and perhaps purchase Colorful Stitchery. I was so wrong. A lot of knitters want to knit and are not interested in learning hand embroidery. Me, I like to dabble in many crafts - with the common design thread being COLOR. 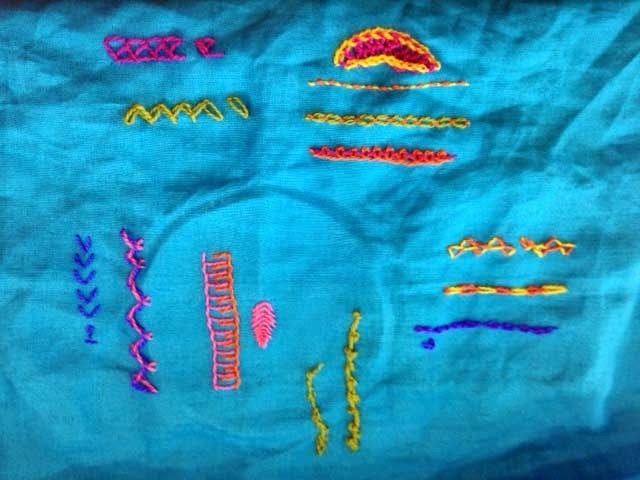 As the years have passed since Colorful Stitchery was published, there is more and more interest in hand embroidery and sewing. I am hoping I can pick up somewhat of a following in that world. There are a lot of good stitching blogs out there - I have some on my sidebar - and I will try to add some more soon to the sidebar. If you know of any more that you enjoy, I would love to know about them. Leave them in the comments or send me an email, if you wouldn't mind. I have some rather exciting news for you all today - Colorful Stitchery is being re-published this September by Roost Books. It has been completely re-designed and looks really fresh and new. Do you know Roost Books? They are doing some very nice books. I am very thankful to them for taking a chance on me with January's upcoming Crafting a Colorful Home and Colorful Stitchery. If you already own it, you won't need to buy it because there are no new projects... unless of course, you want the new version. Here is the cover - isn't it pretty? The cool thing for me is having CS out there again will bring me to the new group of stitchers who were not making things in 2006. The DIY culture is so big now - and still growing. It is a very exciting time to be involved in this movement. 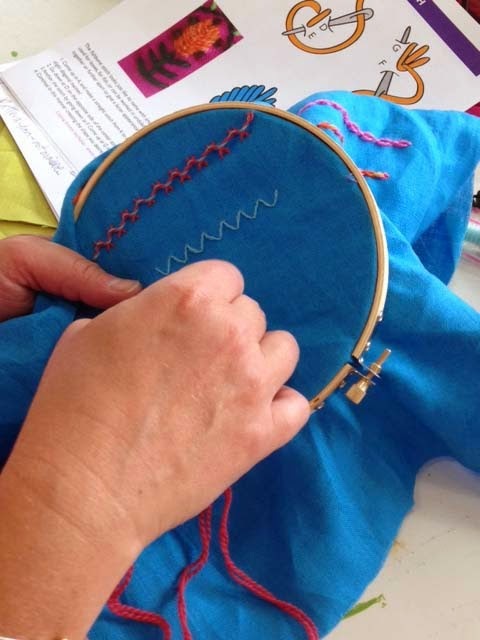 Speaking of movements - do you know about The Slow Stitching Movement? It is being launched by Mark Lipinski who is a blogger, podcaster, and mover and shaker in the quilt world. Check it out and sign up for Mark's daily blog if you like. Since this post is looking rather blue today, I'll close with a photo of the Blueberry Bonanza Bars which I made for my students. The recipe is from Farmgirl Susan of Farmgirl Fare and here is the link. Very delicious with a crunchy oat-ey crust. Next time, I would cut back a tad bit on the sugar. 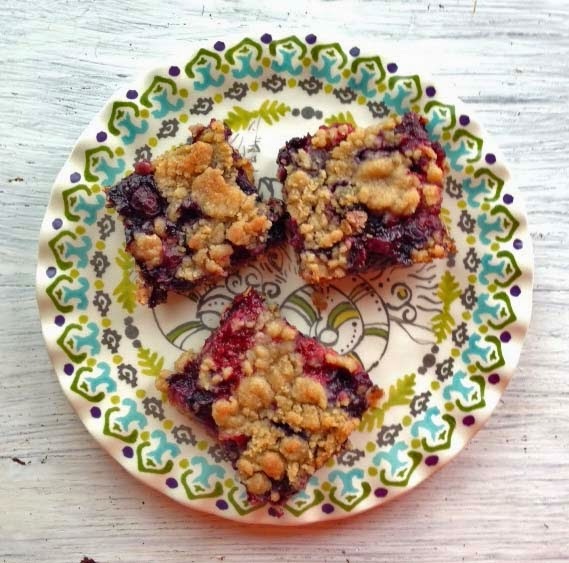 Since blueberry season is coming here soon, I bet I will make these again. I hope you all have a great week. If you didn't see the new stitching kits for beginners and kids last week, check them out here. yum! BLUEBERRIES... [I drink the juice everyday!] -- You know...I was just looking at the Border Design on that Plate... Wouldn't IT be "interesting" to Stitch? Congrats, Kristin! I'm with you--dabble in stitchery and have them all play well with each other. I love my copy of Colorful Stitchery, but the new cover is delightful! 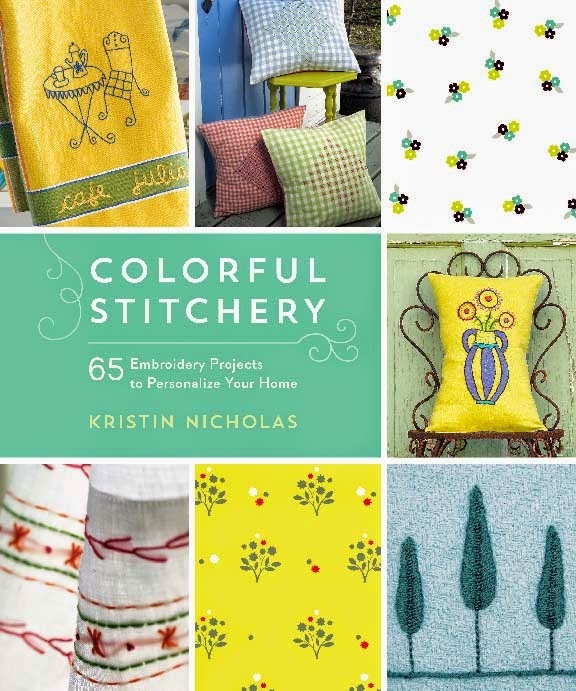 So excited to get my hands on a copy of Colorful Stitchery! I do a lot of embroidery when I need a knitting break. One of my favorites to follow is Mollie at Wild Olive (http://wildolive.blogspot.com). She writes about other fun crafty projects, too, and has very sweet and whimsical embroidery patterns. 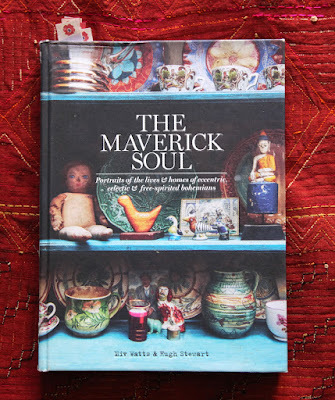 Congratulation on re-issuing the book- it looks wonderful. I'm making good on my plan to start stitching again this summer (I also always stitched, but just not much in the last..um...long time). I just wish I had more time to play with it all.